The Ceann Comhairle of the Dáil has described the use of an Oireachtas phone line to make over 3,000 calls to an RTÉ reality TV competition to vote for a TD's son as an 'outrageous use of facilities'. Sean Barrett has demanded that the money be repaid in full and said that he would be raising the issue at the next meeting of the Committee on Procedure and Privileges. It emerged today that 3,600 votes were cast for Michael Healy Rae using Leinster House phones, where his father Jackie was a TD, costing taxpayers over €2,500. Michael Healy-Rae - who succeeded his father as TD for Kerry South - has denied being involved in the calls to the premium line. When the abuse emerged four years ago, the Houses of the Oireachtas wrote to then TD Jackie Healy-Rae, but received no reply. Tánaiste Eamon Gilmore has said the Houses of the Oireachtas Commission may have to look at phone calls. Earlier, a Fine Gael senator called for an inquiry into whether the facilities at Leinster House were abused in the case. In the Seanad today, Michael Mullins said there should be an investigation into the matter to ascertain if there was a manipulation of a national competition. In a statement tonight, RTÉ said that it and its service providers no longer had detailed call records because the voting took place in 2007. RTÉ Television also said that votes cast for Independent TD Michael Healy-Rae using Oireachtas phones could not have altered the outcome of the reality show in 2007. It said that €7.5m was raised for charity and that Mr Healy-Rae had received more than twice the number of votes cast compared to his nearest challenger. Independent TD Michael Healy-Rae says he does not know how 3,636 phone calls were made from Dáil Éireann to a reality TV show vote while he was a contestant. 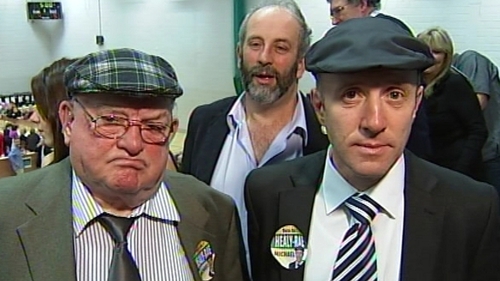 Mr Healy-Rae subsequently won Celebrities Go Wild in 2007 after a public vote. Speaking on RTÉ's Morning Ireland, he said it could not be confirmed if the calls came from one phone or a number of phones in Dáil Éireann. The cost of the calls has been estimated at €2,639. Mr Healy-Rae said he was not responsible for, or how, people voted. When asked whether suspicion would fall on his father, former Kerry South TD Jackie Healy-Rae, Michael Healy-Rae said he did not think his father would have made the phone calls. ‘As you know, my father was an exceptionally busy politician when he was in Dáil Eireann as the voting arrangements at the time were extremely tight,’ he said. ‘You can take my word, that what I would have been doing for the week would have been the least of my father’s concerns at that time, because every time the bell would go for a vote in the house my father would have to be there. He said, however, he had not asked his father whether he made the phone calls. Michael Healy-Rae added that unless he had mastered bi-location he did not see how he could be accused of making the phone calls himself. The Houses of the Oireachtas are expected to issue a statement later this evening on the usage of internal phones by members.